I couldn’t really finish this series of “10 Years in London” blog posts without talking about something I probably do most of out of all the leisure opportunities available. I like a good pint, and wittling down this list to just ten was difficult, but here they are. Because I had to set the boundaries somewhere, I decided that pubs would only be included if they were in Central London – there’s some excellent pubs but only those in Travelcard Zone 1 are here. In order to make this some logical sense, I’ve split the pubs up geographically, so lets begin in the West End. Of all the pubs on this list, I’m pretty sure this is the first one I ever in. And it was a sight to behold. Photo by Tom Austin. Creative Commons licensed. The Porterhouse is a chain of pubs hailing from Dublin who brew their own beer. It’s a small chain, mostly still focused in Dublin, however in 2000 they opened an outlet in Covent Garden. The first thing that’s noticeable about the Covent Garden branch is its size – this place is huge, spread over three floors. Yet it pulls off an amazing feat as the place rarely feels big. There’s loads of little nooks and crannies and snugs in. Even when the place is really busy, you’ll be amazed to find that you can sit in a little corner and feel like you’re in a tiny little pub. Then there’s the beer. Porterhouse do some fantastic beers of their own, all brewed in Dublin and made to simple recipes with good quality ingredients. There’s three stouts (the Oyster Stout is superb), three ales (I like the Porterhouse Red) and three lagers (well frankly I’ve never tried them but I’m sure they’re fine). All the beers are keg bar the TSB, and there’s usually a guest ale on as well. However the other reason to revel in the Porterhouse is its bottled beer selection – there’s hundreds from across the world. Want a beer from Uganda or Chile? Well they probably have one from both. One of my favourite games is to just play beer roulette. Shame that most of the ones I pick seem to be poor pilsner imitations, but I keep on doing it none-the-less! When I worked in London’s West End I seemed to come here a lot more than I do now. But even so, it remains a firm favourite. Even if it was around a year ago when I last went. The Porterhouse is at 21-22 Maiden Lane, Covent Garden, London WC2 E7NA. Nearest stations are Covent Garden, Embankment and Charing Cross – all on the tube, and of course the latter is a National Rail station. Named after Rear Admiral Cloudesley Shovell, the Ship and Shovell is London’s only pub in two halves. What this actually means is that there’s two pub buildings, split by a alleyway in the middle. Given the two building nature, you might think it was once two pubs – the Ship and the Shovell which later merged. I can neither deny nor confirm this from my limited research. At one point it was called the Craven Arms and at another just The Ship, that much I do know. Anyway, given this is in essence two pubs, what do you get? The larger side is an L shaped room, with lots of mirrors and a big bar. The smaller side is my favourite. It is less ornate, has a bar barely big enough for one member of staff to hide behind, has a tiny snug and an upstairs room that looks like it was once someone’s living room. It’s owned by Hall and Woodhouse, who most will know as the Badger Brewery. The larger half has more beers on tap, however thanks to the magic of underground passageways, the staff in the smaller half can ring up and get stuff ordered from the bigger half. Mind you it’s just as easy to go over the road and get it yourself. The beer is great and there’s always an atmosphere. However its right next door to Charing Cross station so can get very busy, and on a Saturday only one half is open. Still, a great haunt when in the area. 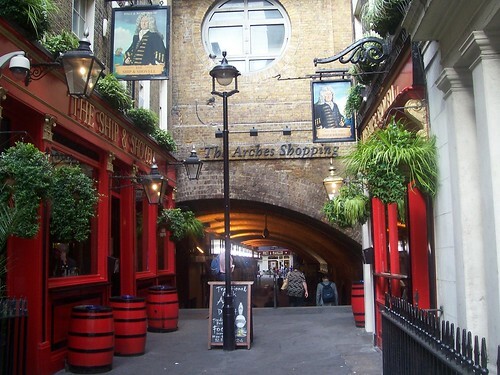 The Ship and Shovel can be found at Craven Passage, Charing Cross WC2N 5PH. The nearest tubes are Charing Cross and Embankment, and for National Rail you want Charing Cross. Photo by Rob Gale. Creative Commons licensed..
As you might have gathered, I have a thing for pubs with a real sense of history – for pubs which take you back in time. Unfortunately time hasn’t been kind on many pubs. Period features disappeared as successive pub companies knocked down walls and “opened” pubs out. However a handful of pubs survived. The Argyll Arms at Oxford Circus is a prime example – it’s an old fashioned gin palace and a big one that’s split into lots of small rooms by ornate wood and mirror partitions. It’s a great history pub in a way that the Princess Louise wasn’t. 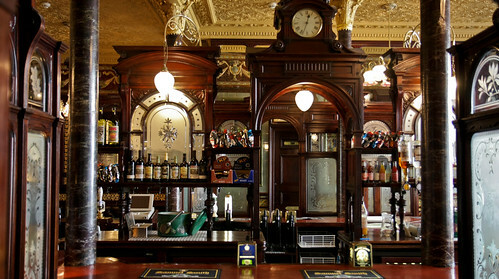 For at the Princess Louise the extravagant interior of wood partitions and ornate glass work had been mostly lost. It still had a lot of period features, including a marble topped urinal. However in the most part it was a shadow of what it once was. Not that most people remembered as they stood at the huge U shaped bar, but never mind. And then owner Sam Smiths closed the pub for refurbishment for about six months. And then the pub re-opened. And all were amazed by what they saw as they’d gone right back to what the Princess was once like. The partitions had returned, the ornate glasswork and mirrors appearing like a phoenix. It’s a majestic sight and one you need to see. True most of it is new, but it shows that pub refurbishments don’t have to be about doing away with the past. The Princess Louise is at 208-209 High Holborn, London WC1V 7BW. Nearest tube station is Holborn. In part 2 tomorrow it’s off to London’s other half – The City. In the meantime if you think I’ve missed out any top West End pubs, let me know by commenting below.